The 17th century church of San Marko was built on the ruins of a Jewish Synagogue at the border of what used to be Enna’s Jewish district. 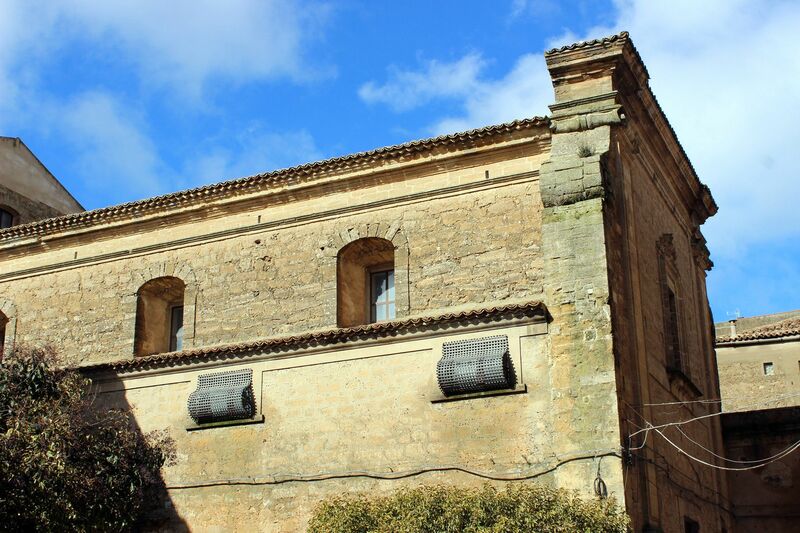 The construction of the Christian church in such place symbolized the “End of an Era” that came to Sicily with Spanish rulers. In fact, expulsion of Jews from Sicily following the 1492 Edict of Alhambra issued by Spanish Crown (Isabella and Ferdinand II of Aragon) took such proportions that these days the Jewish presence in Enna is only a distinct memory remembered maybe only thanks to the nickname “Giudecca” (Judeca) given to this section of the town. 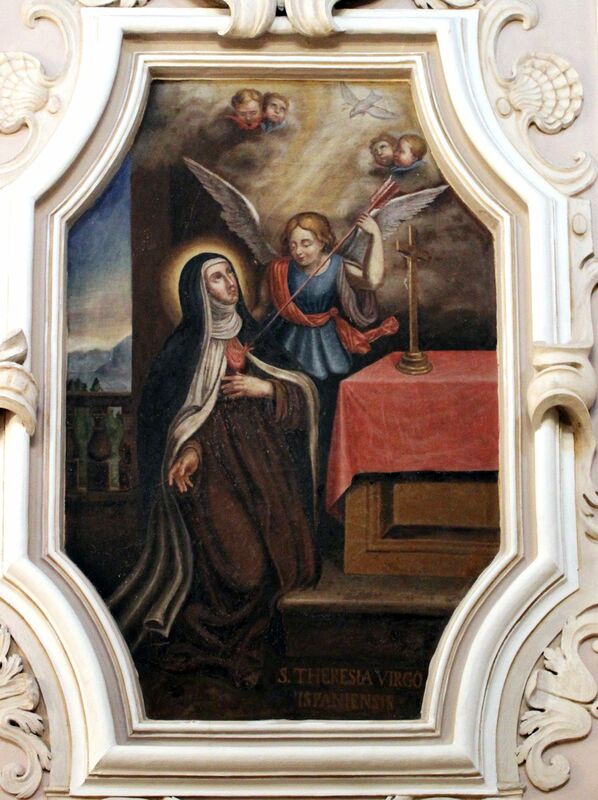 The church was commissioned in 1643 by Angelica Petroso – the abbess of the nearby convent of Discalced Carmelites. 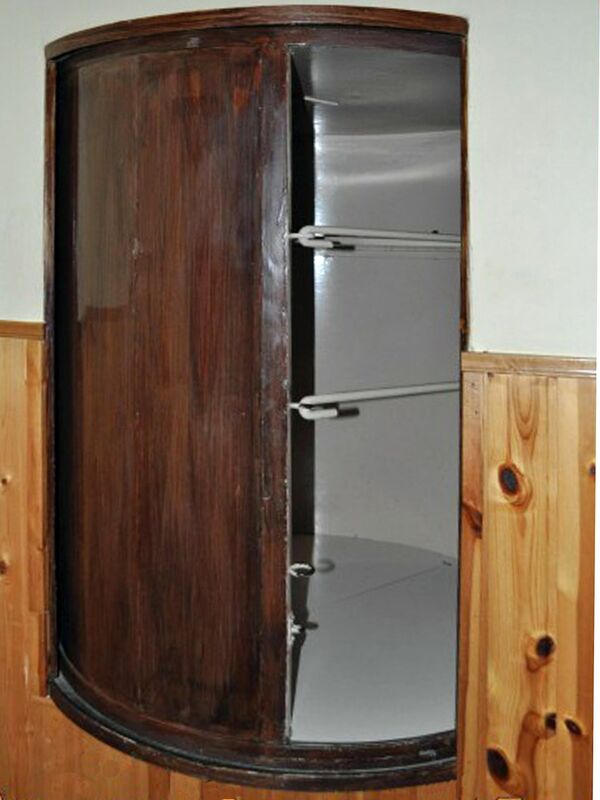 The church was specifically designed the way to allow participation of Carmelite nuns in sacred services. Connected to the convent by a network of hidden galleries, the church was an inseparable part of the religious complex. From the outside, the church can be seen as an unpretentious structure with simple façade flanked by two square pillars. Only an elegant central window topping the façade may signal richness that can be found behind the austere stone walls. 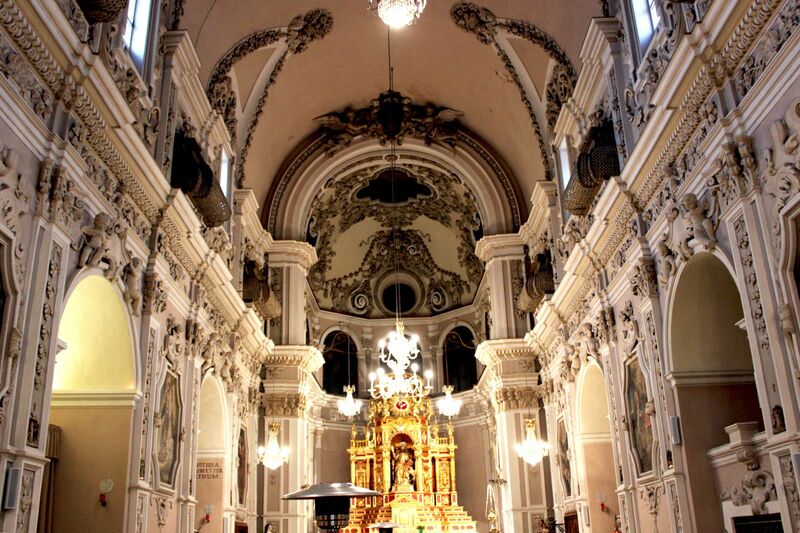 Church of St. Mark is a single-nave Baroque structure covered by a barrel vault. Quite surprisingly, the church does not have transept and central dome – traditional architectural elements of churches at those times. 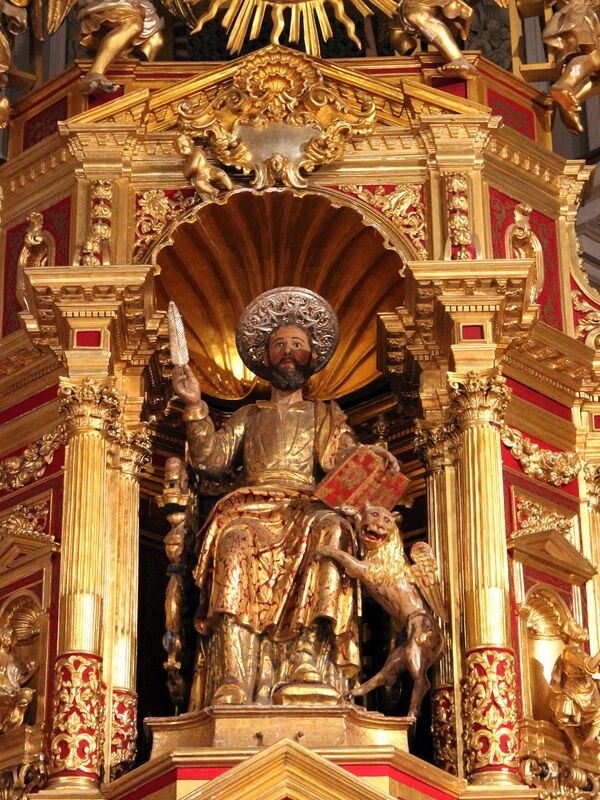 The High Altar is a real masterpiece of woodwork from an early 17th century. 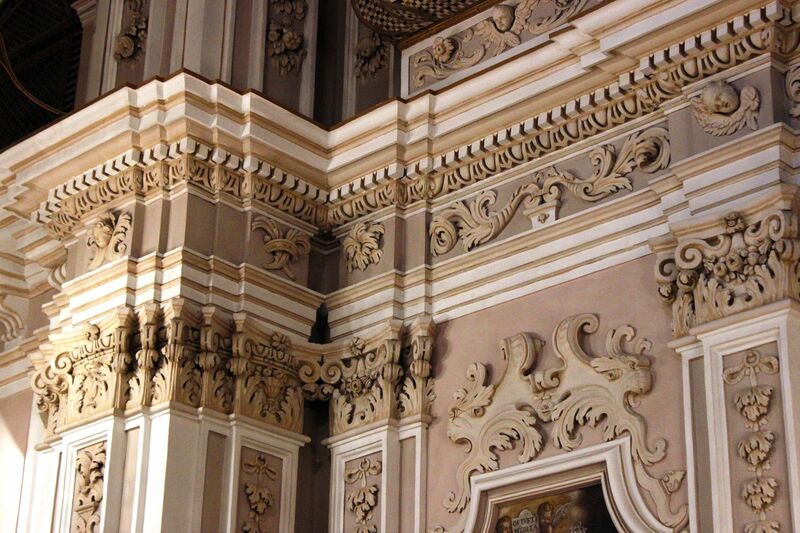 It was designed by Agatino Daidone – an architect and mathematician from nearby Calascibetta. 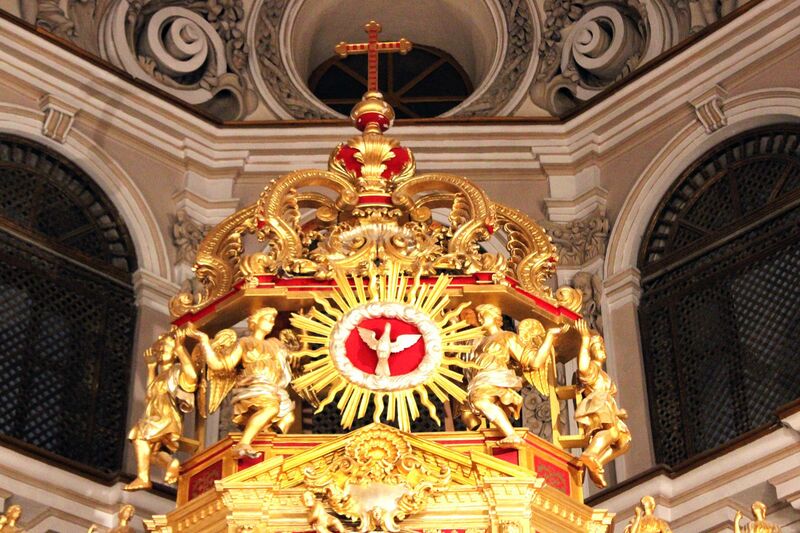 Made in form of façade of a baroque church, the High Altar actually looks like a “church within the church”. Four steps (like in the real world) placed above the altar’s table lead to the central portico. The portico crowned by large shell holds the statue of St. Mark the Evangelist. Sitting on the throne in company of winged lion San Marco holds in his hands a quill pen and a volume (perhaps writing his Gospel). The main portico is flanked by side portals with columns surmounted by Corinthian capitals. 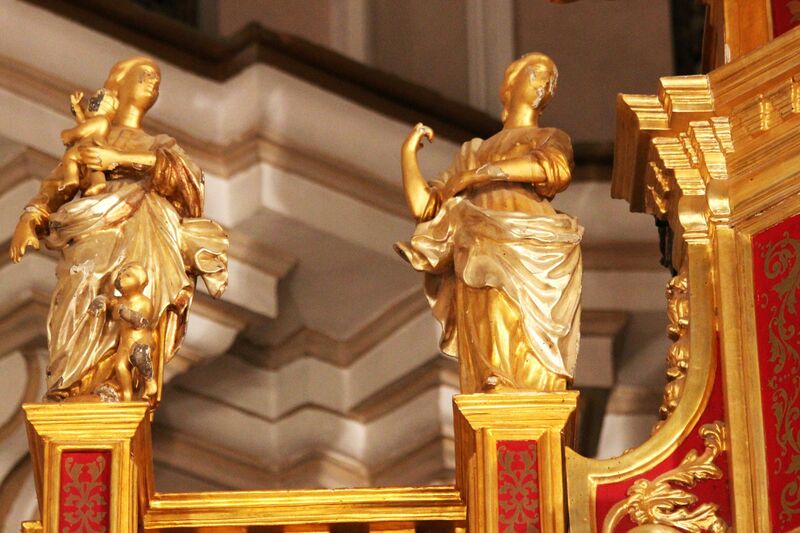 The portals hold small statues of four evangelists: John, Matthew, Mark and Luke. 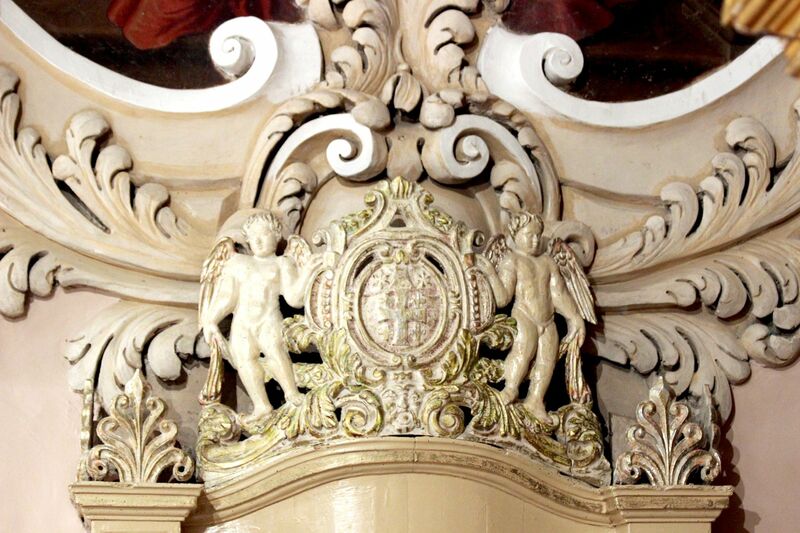 On the top of this façade-like altar are four feminine statues - probably personifications of cardinal virtues. The Tabernacle crowned by tympanum is located in the central part of the steps. 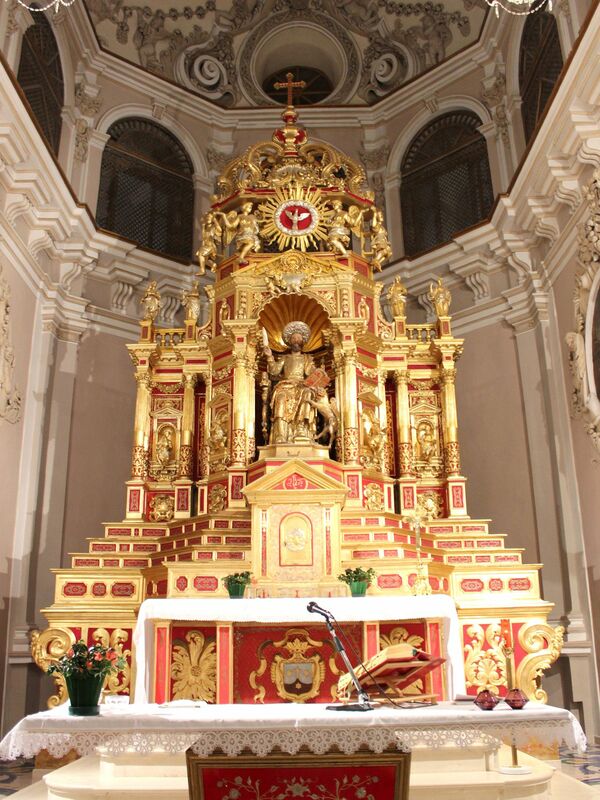 The whole wooden structure of the altar is covered with gold leaves. Four side-altars are placed symmetrically on both sides of the nave. The 18th century canvases are work of mostly unknown artists and illustrate the scenes of Crucifixion (first on the left), Our Lady of Mt. Carmel (2nd on the left) then The Immaculate (first on the right side) and San Marco (2nd on the right). Canvasses depicting Madonna of Mt. 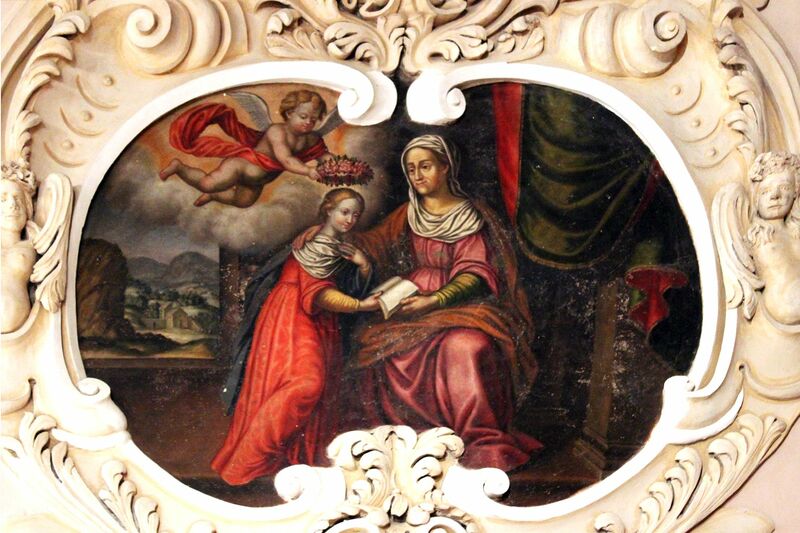 Carmel and The Immaculate express special devotion of Carmelites to the Mother of God. 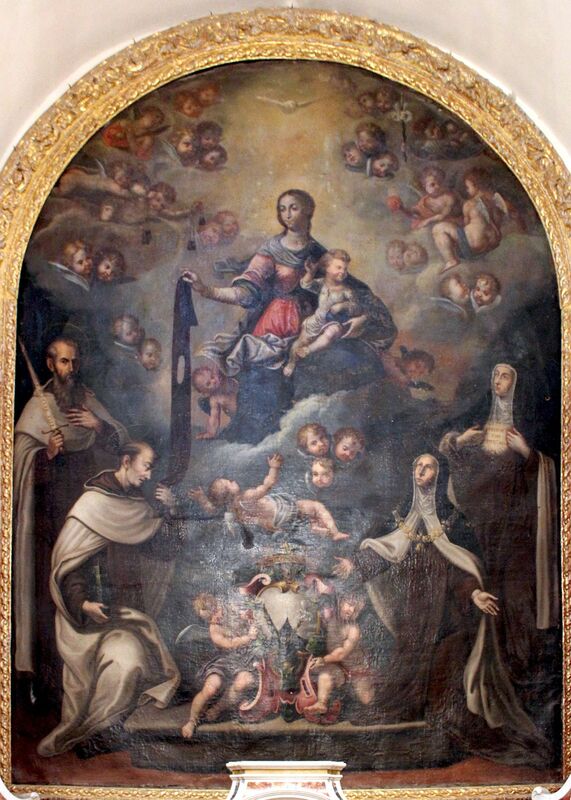 On the first canvas Madonna with Child is shown among Carmelite brothers and sisters (the latter possibly representing real personages from the nearby convent). The scene reflects belief that members of Carmelite Order will be saved from eternal punishment. 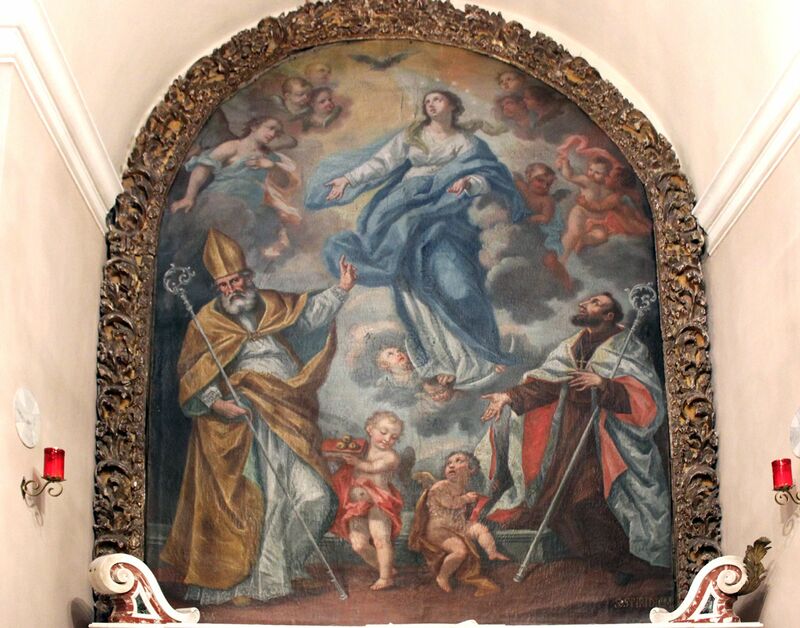 The 2nd of mentioned canvasses depicts the Mother of God watched over by the Holy Spirit with on Her sides two most prominent Greek bishops– St. Spiridion and St. Nicholas. 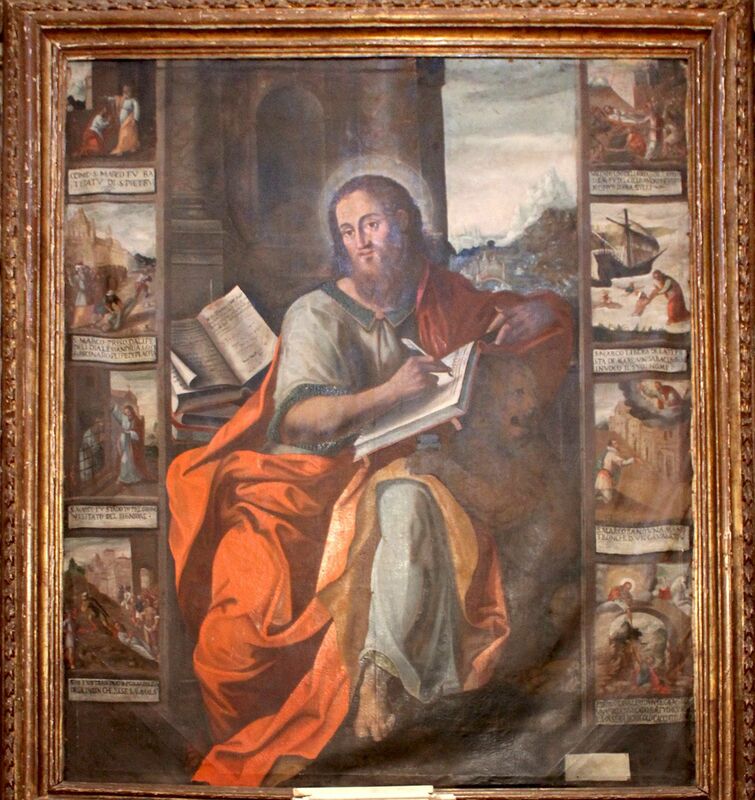 The canvas is work of Thomas Sciacca of Mazzara. The side altar dedicated to St. Mark holds the oldest and most complex canvas. It depicts San Marco with his evangelical symbols: pen, Gospel and lion. The main part of the canvas is surrounded by eight panels depicting scenes from the life of the saint including his death at the hands of Alexandria’s Jews. This brings to mind a thought that dedicating to St. Mark the church erected on the ruins of the Jewish Synagogue was a deliberate decision with high symbolical value….. 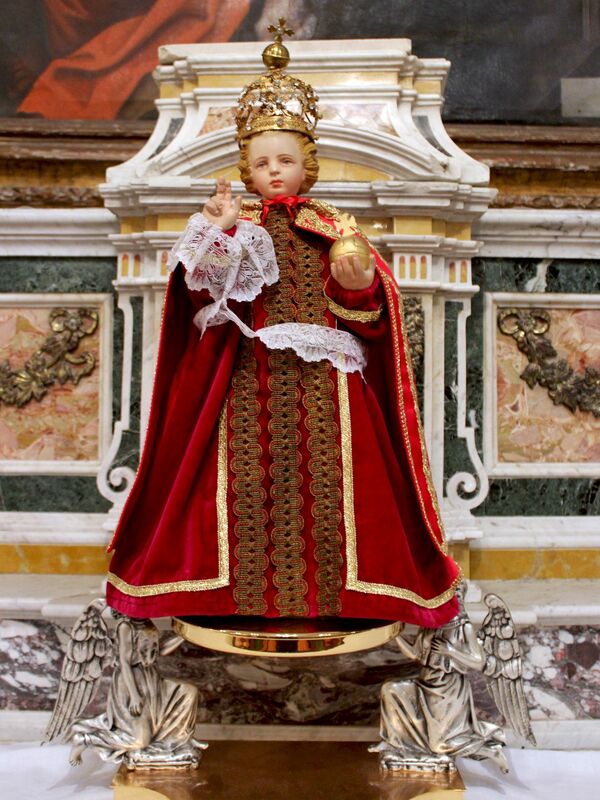 Interior decoration includes stuccoes of Puttie (chubby children), garlands and in general typical Baroque-style ornamentation. 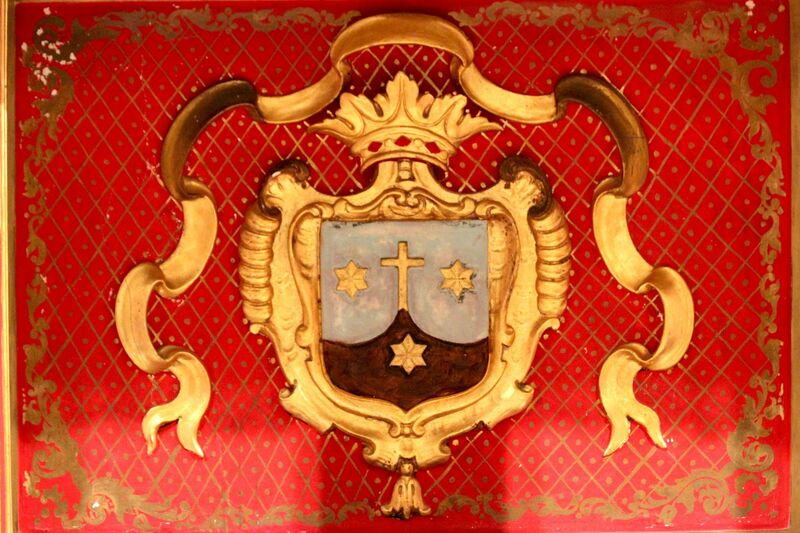 It is work of a Sister Carnazza Gabriele de Blanco commissioned in 1705 in an attempt to beautify the otherwise modest church. 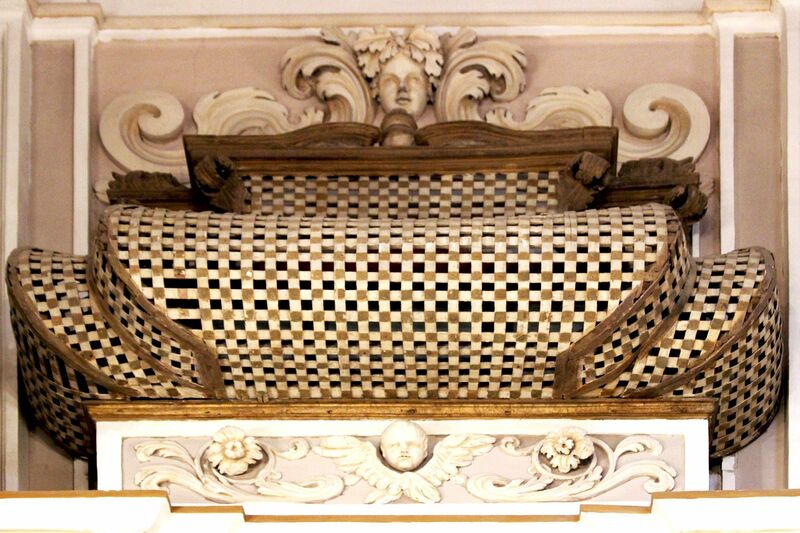 Up on the walls are several balconies covered by beautiful “goose-breast”- shaped wooden lattices. They were reserved for Carmelite nuns attending church’s services. Discalced Carmelite nuns dedicated their lives to prayers and contemplation and due to strict monastic rules, there were barred from the outside world. The balconies provided for them required “separation” barrier and invisibility. In the frontal part of the church there are still visible half-closed “Turn-tables” - the only means for nuns to keep contact with the outside world. As earlier mentioned, the church does not have the crucial element of religious structure – dome. 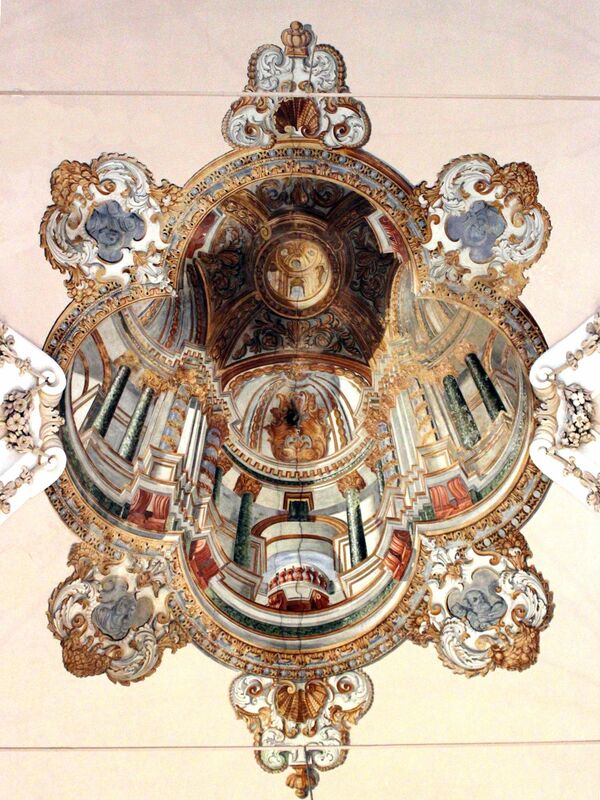 The 3-D like fresco in the central part of the ceiling depicting soaring dome makes a false impression of the real one. Encircled by four semi-spheres, supported by pairs of marble columns and painted in an asymmetric view, the “fake dome” seen from the entrance makes a strong illusion of reality. Wall frescoes depict several saints, mostly related to the Carmelite Order. 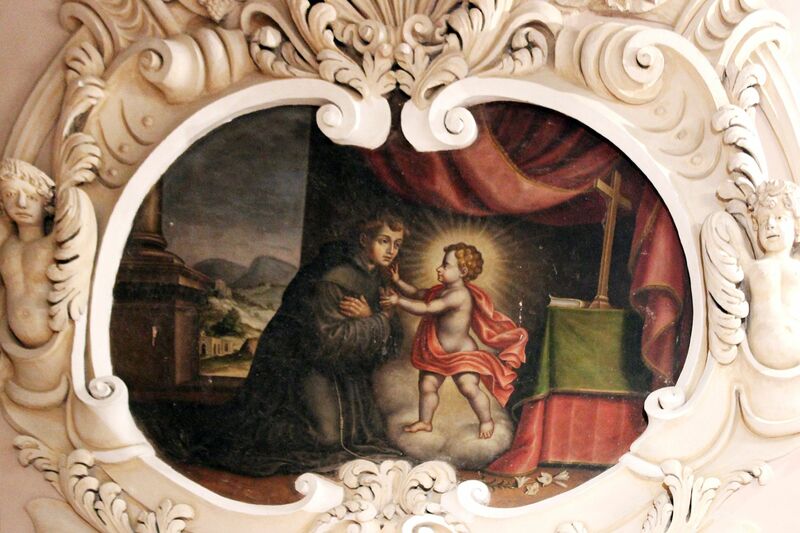 The most notable is probably the one presenting “Baby Jesus appearing to San Antonio from Padua”.